The San Jose Sharks, struggling mightily since a 7-0 start, might have found their lucky charm last week. 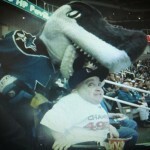 With Howard Stern Show regular Eric The Actor in attendance for his first-ever hockey game, the Sharks scored three goals in the first 10 minutes and routed the Pacific Division leading Anaheim Ducks 4-0. “Anytime you want to come back, you just let me know,” Sharks captain Joe Thornton told Lynch in the team dressing room after the game. 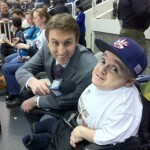 Thornton is a longtime Stern Show fan, dating to his years in Boston. In fact, Lynch’s visit Wednesday stemmed from a recent postgame interview in which Thornton, speaking before the HP Pavilion crowd, was briefly interrupted by somebody shouting “Baba Booey” — universal code among Stern fans. Sharks publicist Tom Holy, another longtime Stern fan, contacted a friend at SiriusXM. That led to an on-air interview with Stern staffer Shuli Egar — an interview that Thornton, a six-time All Star and the 2006 league MVP, called one of the highlights of his career. “Look who we got here!” Thornton exclaimed as he introduced his teammates to Eric, a 38-year-old Sacramento man confined to a wheelchair, and a 10-year regular caller to the Stern Show. At one point, Thornton and his brother John, who also serves as the player’s agent, crouched at either side of Lynch for a photograph. “This is going to be our Christmas card,” Joe Thornton said.